At the outset of his Rule for monastic life, Augustine expressed the fundamental motivation for Augustinian Religious Life in this terms: " the main reason for which you have been brought together is that living in one house, you be of one mind and have one heart intent upon God". but in order to SERVE GOD and to dedicate our very existence to the service and needs of others. - to strive together, as united as possible, within the context of committed christian �community�, to develop intense spiritual friendships with like minded brothers and sisters. This is �the cult of the friendship� and the sense of the ecclesial communion which are characteristic of Augustine�s vision. Many people make up the �Augustinian Family�. Those persons or groups who draw their inspiration from the life and spirituality of Saint Augustine and seek to live a consecrated life based on the Augustinian Ideal, are truly members of the Augustinian Family. A great number of male and female religious communities and �institutes of consecrated life� have embraced this ideal through out the ages. Virtually always, these have drawn, in some way or other, from the historical experience of the �Ordo Eremaritarum Sancti Augustini� (The Order of Hermits of Saint Augustine) or the �ORDER OF SAINT AUGUSTINE�. This community, founded BY THE CHURCH itself in 1256, is commonly called the Augustinian Order. - O.S.A. Order of S. Augustine : it is considered the nucleus of the augustinian family, since it is the first to bear this name, and was founded by the Church in 1256 by federating numerous autonomous monasteries of men which lived a common life according to the Rule of Saint Augustine. Present in 40 countries of the world, this branch consists of clerics (ordained) and lay brethren. - O.A.S. 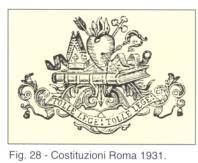 Discalced Augustinians (Agostiniani Scalzi) ; (The �shoeless� Augustinians) Originally this was a reform movement within the Order of Saint Augustine from the Sixteenth Century. This group of friars sought to live a more austere life of simplicity based on the Rule of Saint Augustine, and wanted to fight the abuses that had crept into the Order of Saint Augustine. After several centuries of tensions between their observances and the leadership of the Augustinian Order, they became a �quasi� recognized new community within the Order of Saint Augustine. 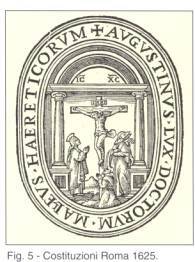 The Discalced Augustinian Community was constituted an independent Order by the Church in 1931. - O.A.R. Augustinian Recollects ; Like the Augustinian Discalced, this community began as a reform movement in Spain in the Sixteenth century. Focusing on the more contemplative dimension of the Augustinian Life, after years of disagreement, struggle, and uneasy peace with the �Order of Saint Augustine�, they were constituted an independant Order in 1912 by Pope Pius X. They work in 20 nations, with a prevalence of Spanish language. 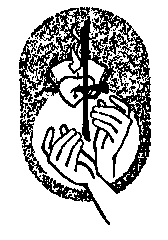 - Augustinian Congregations of apostolic life, (Augustinians of the Assumption, Servants of God of Saint Augustine, Monks of Adoration, The Alexian Brothers, The Augustinian Servants of God, Oblates of St. Augustine). The congregations of apostolic life which embrace the Augustinian Rule are too numerous to list here. Each of these communities, having their own Constitutions and governance, are joined, at least spiritually to the wider Augustinian Family. - Augustinian Sisters of the Apostolic Life: there are a number of Augustinian Institutes and congregations, scattered all over the world. Each inspired by Augustinian Spirituality, and basing their religious life on the Rule of Saint Augustine, they dedicate themselves to several works of apostolate; schools, hospitals, missions, catechesis, youth... etc. A third part of the Augustinian Family is the lay branch. This branch is known as: �The Secular Augustinian Fraternity� (S.O.A.R. ), �The Oblates of Saint Augustine� (Ob.S.A. ), �The Secular Order of Saint Augustine� (S.O.S.A. ), �Third Order Augustinian� (T.O.A.) or Tertiaries. This is made up of priests, laymen and laywomen who live in the world, carrying on their lives according to the spirituality of the Saint Augustine and the Augustinian Family. - Augustinian spouses. These are couples who devote their married life to service, while living an Augustinian spirituality of community, poverty and obedience. - Augustinian Youth. These are youth who, having been catechized in the teachings of the Church and the spirituality of Saint Augustine, embrace a temporary experience of consecration, in order to better prepare for Christian life as a married person. The ideal of community is so important to the Augustinian spirit that every attempt is made to bring members of the �secular Institutes� together frequently, or better still, to even live together when possible. Other things are used to facilitate the notion of community: common prayer, according to the mind of the church, days of recollection, a newsletter, gathering for feastdays and anniversaries, frequent inter-action and communication. The search for God is the basis which guides the spirituality of Augustine. This search is an honest one, grounding itself in truth (about God, self, other) and anchored in faith in Christ and the faith of the church. It is an on-going search because the truth of God is unfathomable and can never be exhausted. It is a search which can never exhaust the riches, wisdom and beauty of God. The more one searches for God, the more one loves Him. The more one loves Him, the more one searches even more to know Him. Interiority, (the journey within) becomes freedom from a slavery to material things, (from hedonism etc.). Interiority becomes the recovery (discovery) of self. Prayer and contemplation is the new (and Augustinian) way to determine the difference between things transitory or lasting. This is the search for God, and interiority leads us always to continue this search with and through the Christian community. Desiring to enter into the experience of searching for God, Saint Augustine admonishes the �seeker� to consider the example of the primitive Christian community of Jerusalem. The Acts of the Apostles tell us that the community of believers were single minded, forming �one heart� and united in spirit. They held all things in common and each person considered his/her own needs as secondary to the other�s. Unity of ideals and hopes, life lived in common, respect for the needs and dignity of the human person: these are the three �colors� which characterize an Augustinian spirituality and community. Longing to experience and reflect the love and communion that exists within the Holy Trinity, Augustinian community seeks to become, on earth, even if imperfectly, a vision of the heavenly city of Jerusalem. The deep and tearing times of today have made prayer and solitude difficult �commodities�, not easily obtained. Still, the search for self understanding and the desire for authentic human intimacy motivates every man and woman. Augustine gives direction to this search by proposing a plan of life �in community�. Such a life, based on solidarity of Christian faith, works to build up the dignity of individuals and a common identity of hope in spite of any personal differences. In an Augustinian community �obedience� becomes collaboration to a common vision and mutual support. Poverty becomes sharing. Chastity becomes a means of expanding the human heart to love fully in the context of fraternity. Embracing these evangelical counsels enables the believer to see that the "burdens" of a common life are outweighed by the beauty of friendship. Christ, who is present in community, not only enforces the person�s unique personality, but increases true freedom of the individual. "Who does not have the Church as his mother, cannot have God as his father." (S. Cipriano) Augustine employed all his energies for the unity of the Church in order to promote the integrity of the faith against heresies. In fact, Augustine put the needs of the Church ahead of his own desire for a hidden contemplative life. He insisted that his companions must embrace this same love for the church, putting its welfare ahead of their own. In a letter to monks he wrote: "do not put your own peace before the necessities of the Church". (Lett. 48,2). The Augustinian community seeks to serve the Church before all else. Becoming united in itself, it witnesses to and promotes unity among all believers. Mastering interiority and contemplation, the Augustinian manifests the fruits of such contemplation by a peaceful communion with the universal Church. It participates in the apostolic work of the church; teaching Christian doctrine, preaching, entering into scientific studies, etc; claiming Christ as the guide for every aspect of human life and activity.